Add all ingredients to a large mixing bowl. 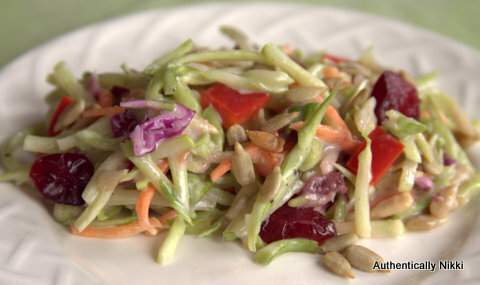 Stir until the dressing is mixed and the slaw is evenly coasted with the dressing. Refrigerate until ready to serve. Recipe can be doubled to serve a crowd. This entry was posted in Salads, Side Dishes and tagged broccoli, slaw by authenticallynikki. Bookmark the permalink.